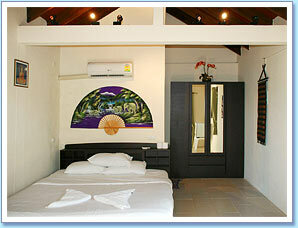 Family, Beachfront & Standard AC bungalows have hot showers, fridge and air-conditioning. 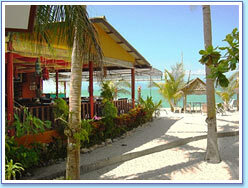 Restaurant and beach bar with Satellite TV & Pool table. 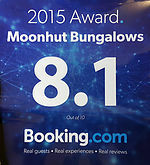 The Moonhut restaurant is situated right on the beachfront and is open all day for breakfast through to dinner. We serve authentic Thai food, Seafood and Western style food, and regularly organise beach barbecues. 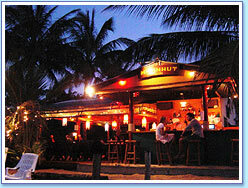 We have a well-stocked beach front bar serving cocktails, wines, beers & spirits, with daily happy hours. Traditional Thai massage in our beachfront sala. We also have a large Thai style "sala" directly on our beachfront where you can enjoy a traditional Thai massage and many other body treatments. 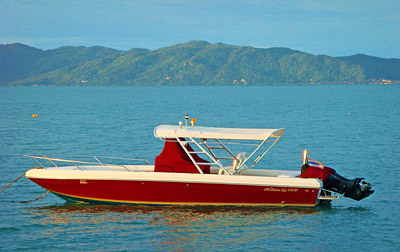 Our fully insured speedboat is available for private charter for trips to Koh Tao, Koh Phangnan, Angthong Marine Park, round Koh Samui or fishing trips or snorkeling trips. You can also try waterskiing and wakeboarding in our calm & beautiful waters. We can arrange motorbikes and 4 X 4 jeeps for individual exploring or any tour or transport to any of Samui or the surrounding area's islands and attractions for you. Tour & Travel reservation service. Taxi & private round the island tour service. A five minute walk along the beach takes you to Maenam village and the ferry pier, which has regular crossings to Koh Pha Ngan and Koh Tao. Nathon, the capital of Samui, is a twenty minute drive from Moonhut, here you will find the Surat Thani ferry pier and a bustling mix of shops, cafes & restaurants. If you want pubs, clubs and an exciting night out, Chaweng Beach is only a short Taxi ride away and offers entertainment to suit all tastes.